Throughout nearly six years of civil war, the Central African Republic’s military has struggled to restore peace. Fighting with rebels and militias has displaced hundreds of thousands of people, while accusations of human rights abuses and ethnic bias have left some civilians in fear of their protectors. The CAR minister of defense, Marie-Noëlle Koyara, hopes to change course. She’s leading efforts to rebuild the military’s reputation and restore the country’s security. “We want a professional army that will truly be of service to the people,” Koyara told VOA’s French to Africa service in a recent interview. Koyara said the country is working on various reforms: background checks on soldiers, training and troop deployments across the country. Military leaders also plan to establish four garrisons in key areas of the CAR. “For there to be a return to security, it is necessary for our security forces, of which the Central African Armed Forces are part, to be reconstructed, because we have experienced the highs and the lows with this army,” Koyara said. Much of the rebuilding of the Central African Armed Forces, or FACA, has been supervised by the U.N. Mission in the CAR (MINUSCA) and the European Union. The United Nations has helped vet soldiers, create a biometric database and rebuild a military camp in Kassai, near the capital, Bangui. The European Union has trained more than 3,000 security forces in the CAR since 2016 and has recently moved to increase funding for training in the country, the Wall Street Journal reported this month. The United States says it is focusing on improving food security for the CAR’s displaced people and providing employment opportunities that make young people less vulnerable to recruitment by militias or extremist groups. 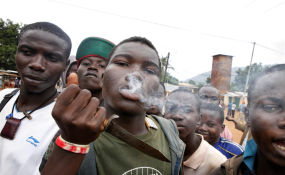 One country has played a more active role in CAR’s conflict. Russia has donated weapons and sent about 500 military trainers to the country. As of September, they have trained more than 1,000 soldiers. Russia is also flexing its diplomatic muscles by working with Sudan to mediate a peace deal among CAR rebel groups. But Russia’s involvement in the CAR has drawn criticism from the international community, which has accused Moscow of destabilizing the CAR and seeking access to its abundant natural resources. “I think any country that wants to play a constructive role, a law-abiding role, is understandably welcome,” Fitzsimmons said. Russian mercenaries in the CAR have also grabbed headlines in recent months. In July, three documentary filmmakers were ambushed and killed in the CAR while investigating the activities of the Russian military firm Wagner. Koyara said she was saddened by the loss of life and is anxious to see the results of an inquiry into their deaths. She called on the international community to help the CAR track and remove mercenaries from the country. This story originated in VOA’s French to Africa service. Idrissa Fall sat down for a studio interview with Central African Republic Minister of Defense Marie-Noëlle Koyara and Deputy Assistant Secretary for the Bureau of African Affairs Elizabeth Fitzsimmons in Washington at VOA headquarters. Salem Solomon wrote the story based on the interviews.